Taking a Christian look at the big questions every person on earth has asked themselves, Rowan Williams asks what it really means to be human. Almost every novel, song, poem, artwork, joke and story ask the same question: what does it mean to be human? In it there are all sorts of issues about identity, consciousness, free-will, maturity, memory, and experience. And it is amongst these questions that Rowan Williams has written a guide to help you think about what it means to be a human being. This not so much an easy-come-easy-go buffet of answers, but rather a guide to help you in your exploration of what being human means. Written with grace and poignant, each chapter of the book explores different aspects of human existence. From consciousness to relationships to faith and science, this book is the perfect philosophical primer for anyone struggling with the big questions. In a similar manner to Alain de Botton, whose own philosophical musings are made to be applicable to everyday life, Rowan Williams ends each chapter of the book with discussion questions that readers of all kinds will find enlightening and fruitful. And at the end of it all, the book asks what it means to be human in the light of Christ, who became one of us, embracing the troubles and vulnerabilities of human life, and then ascended back to divinity. For anyone wanting help thinking about the big questions, or just wanting a different way of looking at life, Being Human is a beautifully-written guide to human maturity and meaning. Being Human by Rowan Williams was published by SPCK in March 2018 and is our 1359th best seller. 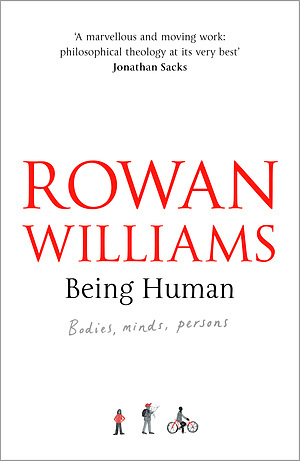 The ISBN for Being Human is 9780281079759. Be the first to review Being Human! Take a peek at some articles related to Being Human. Got a question? No problem! Just click here to ask us about Being Human. What is consciousness? Is the mind a machine? What makes us persons? How can we find the path to human maturity? These are among the fundamental questions that Rowan Williams helps us to think about in this deeply engaging exploration of what it means to be human. The book ends with a brief but profound meditation on the person of Christ, inviting us to consider how, through him, 'our humanity in all its variety, in all its vulnerability, has been taken into the heart of the divine life'. With discussion questions for personal or group use at the end of each chapter, this is a book that readers of all religious persuasions will find both challenging and highly rewarding.